8-Bit Vintners is the creative love child of Mike James. 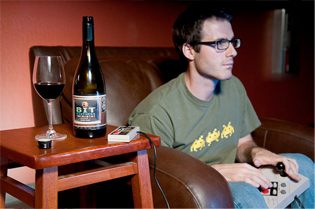 His passion for wine and love of gaming has come together to create the coolest mash-up since The Flintstones met The Jetsons. All fruit comes from high-end vineyards within Columbia Valley and Walla Walla Valley AVA's. It is produced with the highest winemaking standards in Walla Walla, WA and aged in a selection of fine cooperage. My wine is for anyone who spent time trying to save a princess or fit odd shaped blocks together. We may have never met, but we have more in common than we ever knew. So blow out that old Contra cartridge, give the NES a good dust off, and pour yourself a glass.